There is training and then there is Saiyan training. At it's core there is a simple fact: no matter how strong you are there is always a way to raise your power levels and advance to the next level. You transform and then continue your transformation when you constantly push yourself to the absolute limit... and then go beyond it. Saiyan training doesn't just take you out of your comfort zone physically, it challenges you mentally as well. Training like Goku takes a lot, a lot of hard work... and serious ballz. There is only one rule: the moment you can do something raise your standards - that's the key to training on a Super Saiyan level. If you can do 100 sit-ups, go 200. If you can do 100 push-ups, go 200. If you can run 10K go faster, go longer, run with a heavy vest Goku-style. Turn your every activity into a challenge and never, ever take shortcuts. Perform an exercise in slow motion to force already tired muscles to work in an almost isometric fashion really loading them along their entire length. When doing push-ups perform them as slowly as you can. By performing them in slow motion you force already tired muscles to perform in an almost isometric fashion really loading them along their entire length. Go as low as you can towards the floor, ideally until your nose touches the floor and then come up. Repeat it until your muscles really cannot do it any more. You will get a lot of muscle shake in your arms as you do this. Stick with it - it’s going to be worth it. Pick your favourite workout routine and double the reps per set (and if you can take it, double them again). Goku's famous "10,000 push ups" challenge is designed to push the Saiyan warrior past all of his limits. Start small, double it and keep on doubling it until you hit a limit you can call a target to beat. Get to as many places as you can on foot for a day (or a week). Carry your groceries yourself in a basket instead of putting them in a shopping cart, don’t use the elevator for a week and take the stairs everywhere. Whenever you see an opportunity to choose a harder route - take it. Goku runs rings round King Kai's planet to warm up and cool down, you only have to go round the block once (or twice). Combine whatever training you are currently doing with a regular run each day. It doesn’t matter how far you go as long as you run every day and run at your top speed for as long as you can. Run uphill - find uneven routines for your runs, the more you have to climb up - the stronger you’ll get. Goku had to climb Korin Tower to get into some kind of reasonable shape, you can surely manage an extra run. Pick a combination from martial arts and do it again and again and again until your body flows in the movements and you can feel your muscles thrumming every time you perform it. Combo example: jab+jab+cross combo, double turning kick, backfist + turning kick, double punch + side kick. Goku puts together a mixture of martial arts moves and practises them again and again, until he is pitch-perfect. Pick three workouts and do them back-to-back. Each workout places emphasis on a different muscle group. By picking three different ones you are forcing your body to work on different aspects of your fitness level and athletic ability. Remember that strength comes as a response to a need, not a desire. Your body needs to feel that it is absolutely necessary to become strong, in order for it to respond and adapt. Set a timer and every hour sit with your back against the wall or hold a plank for as long as you can each time. 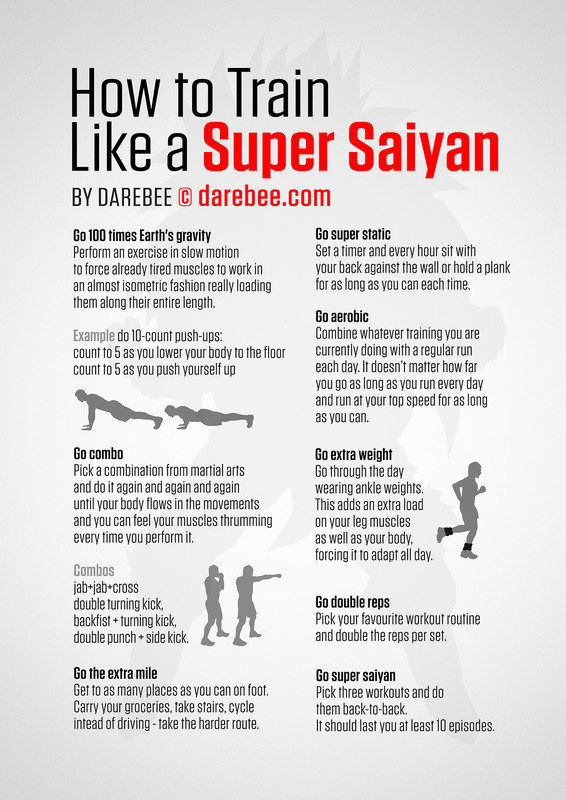 Super Saiyan training is a way of life not a casual workout. Go through the day wearing ankle weights. Apart from driving (and swimming, of course) do all your normal everyday activities wearing ankle weights. This adds an extra load on your leg muscles as well as your body, forcing it to adapt all day. Do this for two days in a row then take the weights off to let your leg muscles recover. You will instantly feel the difference. Goku fought in the 23rd World Martial Arts Tournament with weighted clothes so he could level up. Do all this and you too will have energy levels of Over 9000.